Last week Western media reported that in his telephone conversation with the EC president, Putin said that Russia was capable of "taking Kiev in two weeks"
MOSCOW, September 05. /ITAR-TASS/. Moscow will not be publishing the transcript of a telephone conversation between Russian President Vladimir Putin and European Commission President Jose Manuel Barroso and considers this issue closed after the EC admitted that the words of the Russian leader were snatched out of the context, Russian presidential spokesman said on Friday. Last week Western media reported that in his telephone conversation with the EC president, Putin said that Russia was capable of “taking Kiev in two weeks.” According to reports, Barroso allegedly spoke himself about this with his European colleagues. However, in an interview with The Wall Street Journal daily on Thursday, Barroso’s spokesperson Pia Ahrenkilde-Hansen admitted that Putin’s words that Russian forces could take the Ukrainian capital in two weeks period were cited out of the context. "I can only add that the president of the Commission informed his colleagues in the European Council in a restricted session of the conversations he had with President Putin,” The Wall Street Journal quoted her as saying. “Unfortunately part of his intervention was made public out of context." 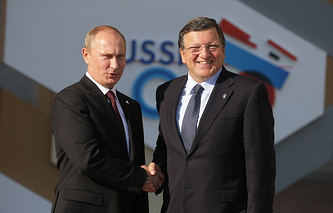 Commenting on last week’s Western media reports, Russian presidential aide Yuri Ushakov said Putin’s words were misinterpreted and criticized the European Commission for making public parts of the telephone talk between EC President Barroso and the Russian leader. In order to put an end to all disputes around the issue, Russian Ambassador to the EU Vladimir Chizhov said the Kremlin administration had both an audio recorded version and the transcript of the whole telephone conversation and was ready to make them public “to remove all misunderstandings.